Thermal decomposition of tetramethylsilane (TMS) diluted in argon was studied behind the reflected shock waves in a single pulse shock tube (SPST) in the temperature range of 1058–1194 K. The major products formed in the decomposition are methane (CH 4) and ethylene (C 2 H 4); whereas ethane and propylene were detected in lower concentrations. The decomposition of TMS seems to be initiated via Si-C bond scission by forming methyl radicals (CH 3) and trimethylsilyl radicals ((CH 3) 3Si). The total rate coefficients obtained for the decomposition of TMS were fit to Arrhenius equation in two different temperature regions 1058–1130 K and 1130–1194 K. The temperature dependent rate coefficients obtained are k total (1058–1130 K) = (4.61±0.70) ×1018 exp (−(79.9 kcal mol −1±3.5)/RT) s −1, k total (1130-1194 K) = (1.33 ± 0.19) ×106 exp (−(15.3 kcal mol −1±3.5)/RT) s −1. The rate coefficient for the formation of CH 4 is obtained to be k methane (1058–1194 K) = (4.36 ± 1.23) ×1014 exp (−(61.9 kcal mol −1±4.9)/RT) s −1. A kinetic scheme containing 21 species and 38 elementary reactions was proposed and simulations were carried out to explain the formation of all the products in the decomposition of tetramethylsilane. Thermal decomposition of tetramethylsilane diluted in argon was studied behind the reflected shock waves in a single pulse shock tube in the temperature range of 1058-1194 K. The major products formed in the decomposition are methane and ethylene; whereas ethane and propylene were detected in lower concentrations. 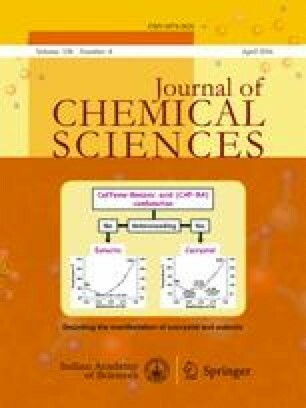 The total rate coefficients obtained for the decomposition of TMS and the rate coefficient for the formation of methane are reported in this paper. B.R. thanks Council of Scientific and Industrial Research (CSIR), Government of India for funding. A.P. is very grateful to CSIR for providing a research fellowship. A.P. also thank Mr. G. Sudhakar and Mr. M. Balaganesh for fruitful discussions and their help.